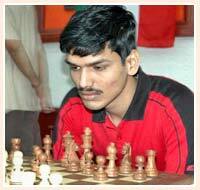 Grandmaster P. Harikrishna is one of the top chess players of India next to Viswanathan Anand. He was born on May 10, 1986, in Andhra Pradesh. In 1996, he became the first Indian to win the under-10 World Chess Championship in Spain and in 2004 he became the second Indian after Viswanathan Anand to be crowned Junior World Chess Champion. In the year 2005, Harikrishna won several tournaments like Bermuda International in Bermuda, Taiyuan Sanjin International in China and Essent Chess Tournament in Netherlands. He holds the record of being the second youngest Indian Super Grandmaster to be placed in the highest ranks of world chess. He was awarded with the prestigious Arjuna Award in 2006.